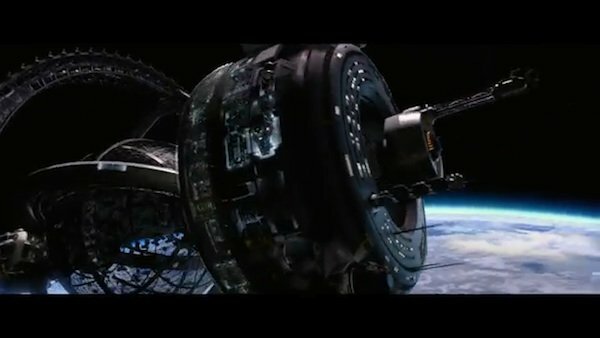 While we still have a few days to wait for the big unveiling of the Ender's Game trailer, last night Summit released a teaser, which gives us a couple snippets of the anticipated preview, introduced by stars Harrison Ford (Colonel Graff) and Asa Butterfield (Ender Wiggin). In case you missed it, watch it above! The full trailer will debut on Tuesday, May 7. Until then, we pulled some screenshots from the teaser to examine (and obsess over) while we wait. Before we get to that, just a note that Enders Game is hosting a Google Hangout next Tuesday. Director Gavin Hood, producer Robert Orci and star Asa Butterfield will be in attendance on Tuesday, May 7. Fans can submit their questions for a chance to have them selected in the Hangout. You can RSVP to the hangout here. Battle school orbits Earth, which is presumably the planet we can see in the background. 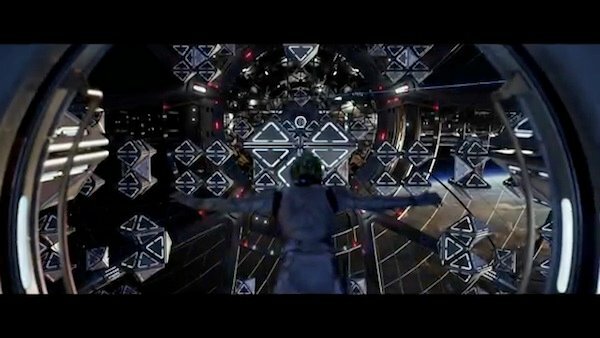 We can see the wheel in the front, and in the center of that (assuming the movie follows the layout of the book) is the zero gravity Battle Room where the kids float around zapping each other flashers (the guns they use to freeze each other's suits). 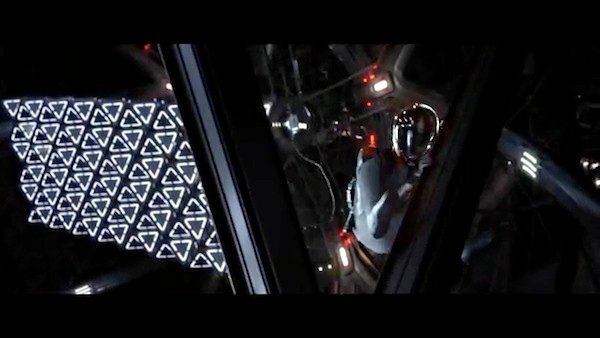 We get a couple glimpses of the Battle Room in the teaser, including this one, which shows Ender's (or someone's) entrance. "The enemy's gate is down!" That's the phrase to know with this film. If you haven't read the book or it's been a while, that's what Ender instructs the other trainees to remember when entering the zero gravity room. It allows them to orient themselves in a room where up, down and side are really any given directions without a point of focus. 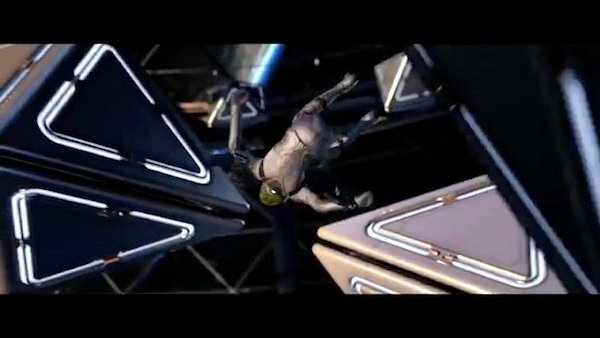 While the above screenshot shows someone flipping through the air, without any harness or cord, the one below reveals a cord attached to the person coming down. Any ideas as to why they're attached to a cord here? Finally, we have a look at some other trainees at the school. And based on the army logos, which were previously revealed and the one we can see in part in the background, I'm thinking we're looking at Dragon Army here. (Book spoiler ahead!). Dragon is the army put together for Ender to command. We also get another look at Ben Kingsley as Mazer Rackham. The full trailer debuted previously at CinemaCon, so we already know a bit about what it will reveal, however we won't actually get to see it for ourselves until Tuesday when it launches online. The movie arrives in theaters November 1. 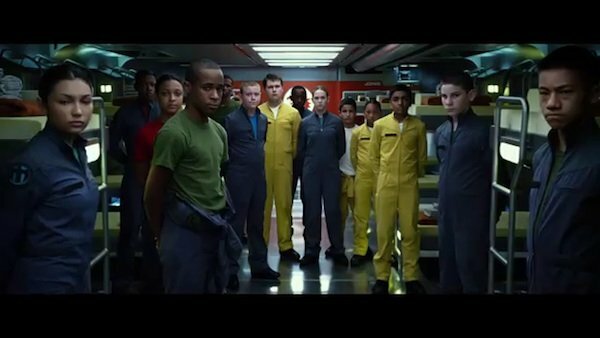 There are a bunch of ways to stay updated on all of the Ender's Game news (besides checking back in with us, of course!). The links to the Ender's Game Twitter, Facebook and Google page can all be found at IF-Sentinel.com.